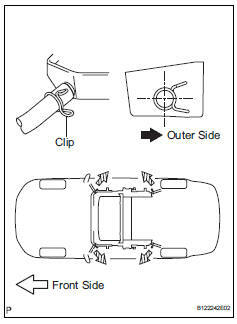 Install the sliding roof weatherstrip. 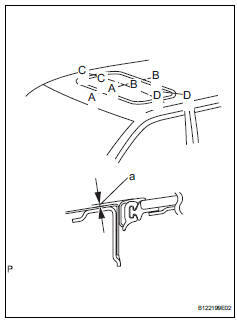 Position the joint of the weatherstrip at the rear center. Align the marks on the weatherstrip with the middle marks at the corners of the plastic on the edge of the sliding roof panel and install the weatherstrip. 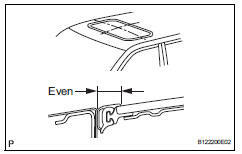 Make sure that the marks on the weatherstrip are positioned within the area indicated by the marks at the corners of the plastic on the edge of the sliding roof panel. Install the lip of the weatherstrip firmly. Install the housing with the 4 bolts and 8 nuts. 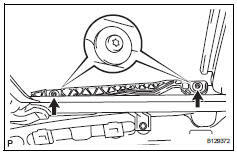 Connect the 4 drain hoses. The clip must face toward the outside of the vehicle and also be above the lower surface of the sliding roof housing when installing the drain hoses. 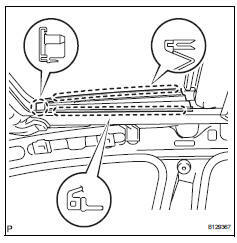 Using a t25 "torx" driver, temporarily install the sliding roof glass sub-assembly with the 4 screws. Check the difference in level for "a" between the roof panel and the upper surface of the weatherstrip when the sliding roof glass is fully closed. "+" Represents the condition that the glass is above the panel level. "-" Represents the condition that the glass is below the panel level. Check the gap between the roof panel and roof glass. The gap must be even all around. Using a t25 "torx" driver, install the sliding roof glass with the 4 screws. Attach the claws to install the garnish. 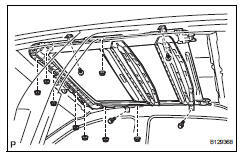 Adjust the sliding roof glass sub-assembly, and check for water leaks. If there are any leaks, readjust the sliding roof glass sub-assembly. Install the roof headlining (see page ir-59).